The sign U+0F39 TIBETAN MARK TSA -PHRU (tsa-’phru, which is a lenition mark) is the ornamental flaglike mark that is an integral part of the three consonants U+0F59 TIBETAN LETTER TSA, U+0F5A TIBETAN LETTER TSHA, and U+0F5B TIBETAN LETTER DZA. Although those consonants are not decomposable, this mark has been abstracted and may by itself be applied to “pha” and other consonants to make new letters for use in transliteration and transcription of other languages. For example, in modern literary Tibetan, it is one of the ways used to transcribe the Chinese “fa” and “va” sounds not represented by the normal Tibetan consonants. Tsa-’phru is also used to represent tsa, tsha, or dza in abbreviations. Thus, according to the Unicode Standard it is quite clear that the Balti letters KHA and GA with a flag should be represented as a sequence of KHA plus TSA -PHRU <0F41 0F39> and GA plus TSA -PHRU <0F42 0F39> respectively. Why then are these two letters being proposed for encoding as distinct characters ? Well, the main reason is that there is a problem with U+0F39 that means that Tibetan text that uses this character may not render correctly if it is normalized; and due to the infamous Stability Policy this problem cannot be fixed. The details of the problem are quite simple : U+0F39 has been assigned an immutable canonical combining class of 216, and Tibetan vowel signs have canonical combining classes of 130 and 132; which means that when normalized U+0F39 will be reordered after any vowel signs, which is wrong as U+0F39 should be more closely attached to the base consonant than vowel signs. Note that this is only a problem if TSA -PHRU is followed by a vowel, and only if the text has been normalized. Personally I do not think that the defect with the combining canonical class of U+0F39 is a legitimate reason to encode these two letters as precomposed characters. The Microsoft rendering engine (Uniscribe) could and should be changed so that both normalized and unnormalized sequences render correctly. Incidentally, [f] and [v] are nowadays more commonly represented using HA plus SUBJOINED PHA <0F67 0FA5> ཧྥ and HA plus SUBJOINED BA <0F67 0FA6> ཧྦ. Thus, if the precomposed letters KHHA (KHA plus TSA -PHRU) and GHHA (GA plus TSA -PHRU) are accepted for encoding, then precomposed forms of at least seven other letters plus TSA -PHRU also need to be encoded, and given its common use in shorthand contractions attached to almost any letter, it may be prudent to simply encode TSA -PHRU versions of all thirty plus Tibetan consonants. Not only would this be a major change to the Tibetan encoding model, but due to the constraints of the Stability Policy none of the precomposed letters with TSA -PHRU would be canonically equivalent to the decomposed forms that are currently in use. This would introduce all sorts of problems with legacy data. 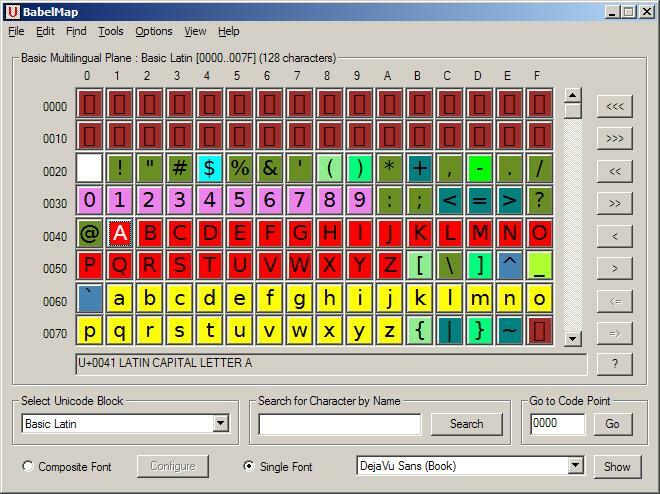 Moreover, people would still be able to compose transcription letters using TSA -PHRU rather than using the new precomposed letters if they wanted (TSA -PHRU could be deprecated but once encoded a character can never be removed from the standard), thus resulting in multiple non-equivalent spellings. All in all, I believe that such a change would be disastrous, causing chaos for years to come. So, in conclusion, I hope to see TIBETAN LETTER KKA and TIBETAN LETTER RRA encoded soon (preferably in Unicode 5.1), and Tibetan rendering engines and/or fonts modified so that they render Consonant plus TSA -PHRU sequences correctly with or without intervening vowel signs. As I hoped, at the September 2006 Tokyo meeting of WG2 it was agreed to encode TIBETAN LETTER KKA and TIBETAN LETTER RRA at U+0F6B and U+0F6C respectively, and not to encode the two precomposed letters with TSA -PHRU. The two accepted letters are under final ballot for inclusion in ISO/IEC 10646:20003 Amd.3, which will correspond to Unicode 5.1. A new release of BabelMap which fixes certain problems that may be encountered by users of non-English locales when they select the option to display all styles of fonts. Many thanks to Nocturnal Dreamer for helping me get to the bottom of it all. John Cowan also had some good suggestions for improving the Composite Font Mappings dialog, but I'm afraid that I haven't been able to do anything about this yet. On Friday someone somewhere mentioned that colour coding characters according to a selected property would be quite useful. I thought so too, so I have quickly added such a feature into the latest release. You can now select any of the following properties from the "Colour Coding" option of the "Options" menu, and each character in the BabelMap grid will then be highlighted in a particular colour according to the value of that property for the character. Even if you select no colour coding then you still get some colour coding now, as assigned characters will be displayed on a white background and unassigned code points will be rendered in grey. The tables below show what colours are used for each value of the various properties other than Script. I'll leave it as an exercise to the reader to work out what colour I've used for each of the sixty-four scripts defined in Unicode 5.0. Having last week discussed Welsh double d, this week I'm going to briefly touch upon Welsh "double l" /ɬ/. 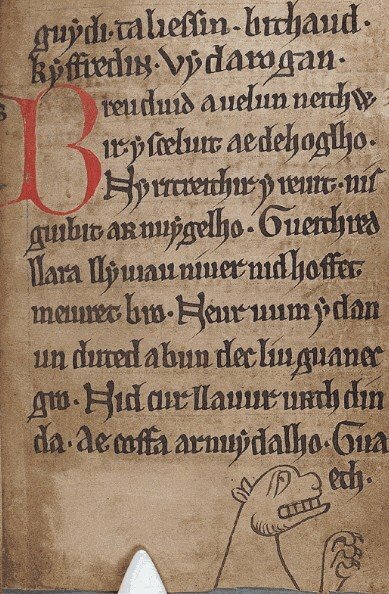 In the earliest Welsh texts the /ɬ/ sound was normally written as "l" initially and as "ll" medially and finally, but in most medieval manuscripts /ɬ/ is written as "ll" in all positions, as in modern Welsh. As the /l/ sound was also sometimes written as "ll", in words that in modern Welsh are spelled with a single "l" (e.g. callon, modern calon "heart"), there was scope for confusion between the two sounds. In order to differentiate the two phonetic values of "ll", in some manuscripts, as well as in some modern editions of middle Welsh texts, the /ɬ/ sound is represented by a ligatured "double l" (you can see some examples in Jones's 1941 transcription of Brut y Tywysogyon given in last week's double d post). This ligatured double l has been proposed for encoding as LATIN CAPITAL LETTER MIDDLE-WELSH LL and LATIN SMALL LETTER MIDDLE-WELSH LL (see N3027), and will available for use from Unicode 5.1.
darllen (line 7), llyfr (line 8), holl (line 15, cf. holh on lines 24 & 25), deall (line 27), etc. This looped form of blackletter letter "l" is not uncommon, especially in 16th century French books (it is also used in Caxton's Canterbury Tales), but it is the first time that I have seen it used contrastively with the ordinary form of the letter "l" to indicate a particular phonetic value. It is even more remarkable to see it used in roman text as well as blackletter text. 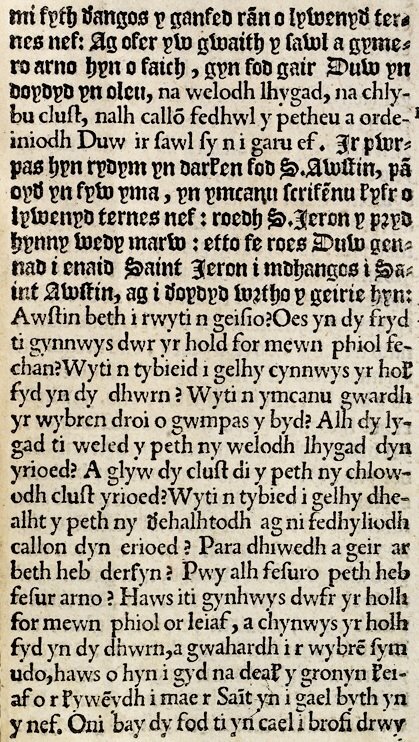 I haven't seen this looped blackletter l used elsewhere to represent Welsh /ɬ/, but then again I only have access to a very few early Welsh books. 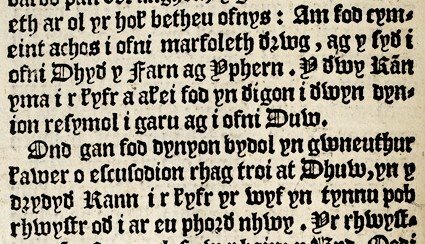 The fact that the blackletter looped l is used in this important text (the first Welsh book printed in Wales) contrastively with "l" to represent /ɬ/ means that it is a very good candidate for encoding in my opinion. The only question is whether it should be encoded as a lowercase letter only or as an uppercase and lowercase pair. In Y Drych Cristianogawl it only appears to occur in lowercase form, and I suspect that it would always be replaced by "LH" or "Lh" in capitals, in which case it could be argued that, like long s and r rotunda, it is a lowercase only letter, and a corresponding capital form is not required. On the other hand, one can easily envisage a blackletter capital looped "L", and for ease of casing it may be simplest to encode a hypothetical capital form. I'm afraid that I'm still obsessing with the finer points of medieval orthography, and so over the next couple of weeks I'm going to discuss a couple of Welsh oddities that I have come across recently. The start of the prophetic poem Breuddwyd a Welwn Neithiwr "The dream I saw last night", written Breuduid a uelun neithir. As far as I can tell, up until the 15th century the /ð/ sound is not normally represented in written Welsh. However, there is one manuscript that does distinguish /ð/ from /d/ in some parts, that is MS Peniarth 20 (mostly comprising the text of Brut y Tywysogion "The Chronicle of the Princes"), which was written about 1330. 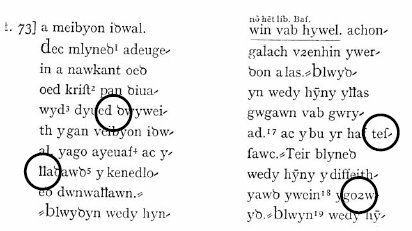 In the latter section of Brut y Tywysogion /ð/ is not differentiated, but in the earlier parts /d/ and /ð/ do seem to be distinguished, as can be seen from the words blwydyn wedy (modern Welsh blwyddyn wedi "the next year") shown below. In the example from page 264 modern Welsh "d" and "dd" both correspond to an ordinary letter "d", whereas in the example from page 73 modern Welsh "d" corresponds to an ordinary letter "d" but modern Welsh "dd" corresponds to what appears to be the common Latin abbreviation for "que", that is the letter "q" followed by the "3" shaped letter "et" (which is proposed for encoding in N3027). I'm not entirely sure whether this is a novel reuse of the Latin abbreviation for "que" or whether there is some other explanation for this peculiar letter, but as I have been unable to find any other examples of it in other Welsh manuscripts, it may be an idiosyncrasy of the particular scribe who wrote this section of Brut y Tywysogion. Whatever the origin of the letter, I think that it must be one of the earliest indications of the phonetic shift of /d/ to /ð/. The following is a short extract from MS Peniarth 20 that shows the use of this letter, followed by the corresponding transcription in Thomas Jones's 1941 scholarly edition of Brut y Tywysogyon (taken from N3027 Fig.1). What seems particularly perverse to me is that Jones transcribes this letter with an "insular" letter d, but transcribes what in the manuscript is an "insular" letter d as an ordinary "d". 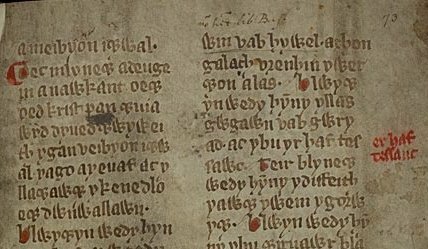 Despite this one manuscript, it was not until the late 15th century that /ð/ came to be regularly represented in written Welsh. During the 15th and 16th centuries it is variously represented by "dd", "dh" or (in blackletter) d with a dot above. In early printed texts, d with a dot above seems most common in blackletter type and "dh" in roman type. However, when representing a /ð/ sound blackletter capital "D" is always followed by an "h" even when lowercase d is dotted (see second example below). This book uses d with dot above, e.g. Blwydyn (blwyddyn "year") on lines 1, 6 and 12. This book uses "Dh" and dotted d, e.g. Dhyd (Ddydd "Day"), Dhuw (Dduw "God"), drwg (ddrwg "evil"), digon (ddigon "enough"). 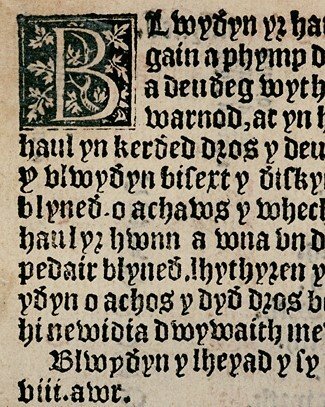 When the Welsh Bible was published in 1588 it used "dd" for /ð/, and due to its overwhelming influence as the standard for written Welsh, "dd" has been used for this sound ever since.